This instructor likes to start with form, or "masses". Basically the heaviest stuff. She then moves us to tone (light and dark). 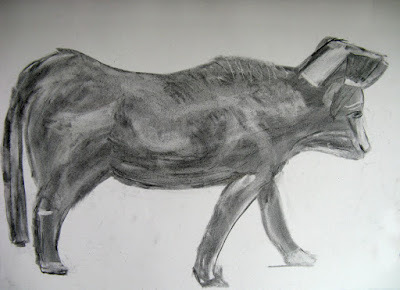 With charcoal, you can basically make the form all somewhat dark and then lighten parts with an eraser and darken other parts with heavier charcoal. We started in the Egyptian Gallery, and worked on a statue of a bull which stands in the middle of the room. It is the Apis Bull, for those curious. Here is my drawing, done on cheap newsprint paper. Afterwards, we were encouraged to find another piece of our own choosing. I chose the Seated Pair Statue, because I thought it was cool how they looked so formal, but still have their arms around each other. This was done on a higher quality paper which we prepped by rubbing charcoal all over it. (Lots of fun. Like fingerpainting for artists.) The faces were hard to capture off a statue, but I feel good about the tone. As anybody following me on Twitter can't have missed, I participated in Pitch Madness this year. It was my first Twitter/online pitch contest, and I mostly did it for the experience. I had fun and might do it again, though I fully expect to get an agent the old fashioned way through queries and patience. In any case, the entire experience was tremendously enlightening, so I thought I'd write down a few of the lessons learned. I wrote ten of them on Twitter, but will expand a bit more here for those interested (and so I remember for later). 1) Your title is the first part of your hook. Make it snappy, intriguing and appropriate to genre/age. There are titles that just jumped out among the winners. Titles such as "My Paper Route and Other Deadly Things" and "Daisy Kincaid and the Time Travel Shoppe" and "The Road to Dusty Death". All of a sudden, my perfectly serviceable "Reach for the Sky" sounds dull. I realized that for middle grade, I need something that intrigues and excites. I think I am going to change to "Danger Tastes Dreadful", which was suggested by Chris Garson from my writer's group. It has several different meanings for the story itself, and I think it has much more of a hook. From the teasers and from the interviews posted by ‏@DaemosChronicle, it was clear that some people just used a Twitter pitch they had created earlier for their 35 word pitch. It was also clear that the slush readers were not impressed by that. Also, and this really deserves its own tweet but I forgot, your hook can include comps. If saying "PRINCESS BRIDE meets DRACULA" communicates a lot about your book, use it. Association is powerful in all pitches, and agents really do respond to those associations. There were several teaser comments that made me scramble back to my first page to make sure I wasn't making this or that mistake... or that I was doing this or that thing. For example, while my stakes don't become clear that early, I added some foreshadowing to suggest the stakes. 4) Unless you are writing about weather gods or rewriting The Tempest, skip the weather report at beginning. Fortunately, I didn't do this, but it was mentioned by multiple slush readers. 5) Know your word counts, and don't try to be the exception. You aren't JK Rowling... yet. While I still live in fear that my word count is too high or low, at least I can tell I am in the right ballpark... and that some people aren't. 6) Foolish consistency is the hobgoblin of small minds redux. Mix up your writing style even in first 250 wds. While this is something I learned long ago in a general sense, the hints about this in teasers reminded me that I better make sure it was evident on my first page. I didn't alter much, but it definitely reads better with the tweaks I made. 7) Unless you are writing about dream elves in Brooklyn, don't start with dream sequence. Not in mine, but at least a couple of authors were scrambling after this advice. 8) If the pitch, or worse, the first page, don't make clear who your MC is, the pitch will be a strike. This one seems obvious, but clearly it isn't. I think one of the problems is people who use a Twitter pitch or logline for the 35 word pitch. In those, roles are preferred to names, but in a 35 word pitch, you have enough (even if it is hard to believe you do) to introduce the main character and give a sense of him/her/it. 9) Unless you are writing about vampires, keep your stakes in plain view. Also, don't write about vampires. This advice (well, without the vampire bit) was repeated frequently. Make the stakes clear in your 35 word pitch. That pitch needs to a) introduce your character, b) make the reader care about your character, c) make the stakes for your character clear, and d) make it clear that you can write a story about that character. Sounds tough, but YOU ARE A WRITER. You can do it. 10) A journey of 1000 miles starts with a single step. So, make it a good one, but not your last or only one. i) have an idea for a next book. Rinse and repeat. Also, the steps don't usually go in that order. You may write a few books before you get an agent. You should probably work on your platform before the book is sold, and preferably before you have an agent.